One of the tried and true ways to make your weight loss easier is to embrace an active lifestyle. Move more around your house, park farther away, and plan your weekends around doing fun activities such as road racing and hiking. Don’t focus on your diet plan and don’t deprive yourself. Enjoy your life and lose weight with pleasure! How often do you use food as your guilty pleasure? Let me guess, often or even every day. Stop doing it and begin eating for health. Figure out the benefits of consuming certain vegetables, such as onions and mushrooms, and begin integrating these vegetables into your meals. Your meals can be healthy and tasty at the same time. I’m sure many of you don’t drink enough water every day. However, it’s vital to drink at least 8-10 glasses of water daily, especially if you are trying to lose those unwanted pounds. Water will help decrease your appetite, eliminate bloating, and flush toxins and waste out of your body. After all, drinking water is not so difficult and it can aid your weight loss goal. Even if you are a super busy woman, you can still make time for fitness. You just need to get your priorities straight. I lead an ultra-busy lifestyle, but I always find time for fitness. Some days I work out at 4am, other days at 11pm. Fitness is important to me, because I know that I do it for my health! Make time for your health and make exercise a regular part of your life. When you are trying to lose weight, a positive outlook is necessary. Stay away from negative thoughts and enter into a positive emotional state. Believe in yourself. 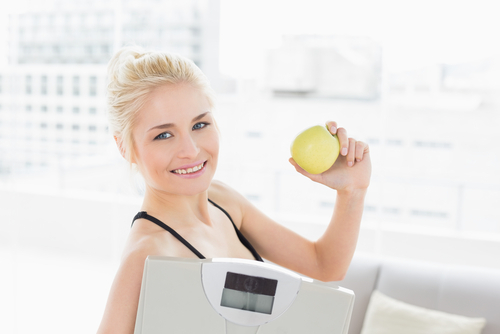 You will certainly reach your weight loss goals. Remember, when you have a great weight loss confidence, you attract positive relationships around you. Perhaps, this is a bit difficult way to make weight loss easier, but positive thinking will lead you to success. Reduce your boredom and challenge yourself by creating new workouts. I enjoy doing a Burpee countdown with jogging in place, and you may also want to try it. While this workout can be a challenge, the results and calories burned during exercise are worth the work. Think out the box and try to switch up your workout so you can reach fantastic results. I must admit I’m a big fan of salads and I know plenty of easy ways to vary up these green delights. I love to create absolutely new dressings, and add nuts, fruits and a few vegetables to my salad. I make my salad the star of each meal and this is why I tend to have more energy, get sick less, eat less, and, of course, weigh less. Do you love salads? What’s your favorite salad? Follow my tips and make your weight loss easier. Believe and you’ll reach your weight loss goal. By the way, what is your weight loss goal? What do you do to achieve it?